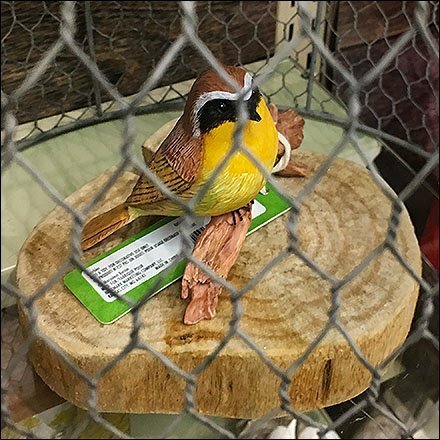 This Chicken Wire Birdcage Prop Adds Realism to the display of a tiny bird on a branch as decor item. The Birdie is tagged and obviously for sale. So too, in all likelihood, the ringed tree slice base and Chicken Wire Birdcage though un-tagged … but as props, they complete and bolster presentation. This Chicken Wire Birdcage Prop Adds Realism visual merchandising courtesy of a Hallmark Gold Crown Store.